The 2018 Sarah Bennett Holmes Award winners Debra Moser and Lisa Collins with UK President Eli Capilouto. Photo by Sarah Caton. LEXINGTON, Ky. (Jan. 25, 2019) — Nominations for the 2019 Sarah Bennett Holmes Award are due by the Friday, Feb. 1 deadline. The Holmes Award, sponsored by the University of Kentucky Women’s Forum, is one of the most respected recognitions at the university. 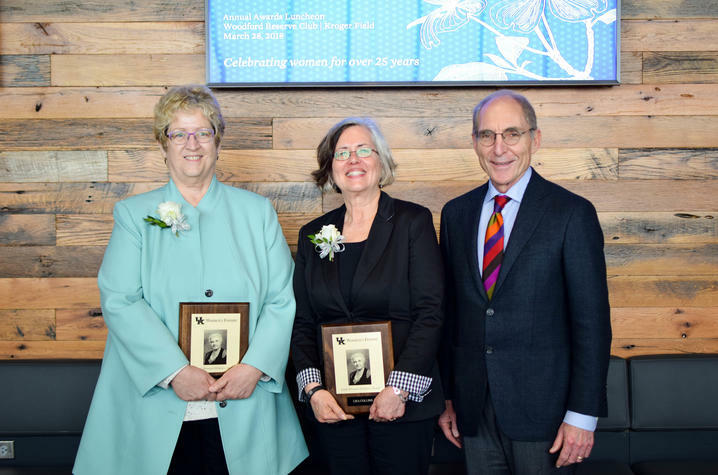 The Sarah Bennett Holmes Award recognizes two female UK employees, one faculty member and one staff member, for their contributions to issues that affect women at UK and across the Commonwealth. These awards are designed to target efforts that might otherwise go unrecognized. For more information, visit the UK Women’s Forum website at www.uky.edu/womensforum/sarah-bennett-holmes-award-luncheon. To make a nomination online, visit https://uky.az1.qualtrics.com/jfe/form/SV_e55FS4mWKQw39E9. Award winners will receive a prize of $1,000. All nominees will be recognized during the annual Sarah Bennett Holmes Awards luncheon beginning 11:30 a.m. Wednesday, March 27, at the Gatton Student Center Ballroom. Information about the luncheon will be available on the UK Women’s Forum website in February. Sarah Bennett Holmes was a distinguished former dean of women at UK who tirelessly championed the rights of women throughout her career. Widowed at a young age, Holmes raised four children while completing her own education. She then began a successful career at UK where she inspired young women to persevere in the face of hardship and pursue their career goals. Among her accomplishments, Holmes developed work programs for women during the Depression. If you have questions about the Sarah Bennett Holmes Award or the luncheon, contact Lynn Hiler at clynnhiler@uky.edu. You can also follow the Women’s Forum on Facebook or on Twitter @UKWomensForum for information about the award and luncheon.